Connect 8 - 60 volts dc power (minimum 500 ma) to the green terminal block that is beside the on/off switch (See figure 1). Connect an Ethernet cable to the rj-45 jack on the RMS-200 board. Turn the device on with the on/off switch. It takes the RMS-200 board approximately 30 seconds to bring up the Linux operating system. The RMS-200 will signal it is ready by first blinking the green status light in a continuous heartbeat sequence. After a few seconds the red alarm leds will display a light sequence. The board is now fully booted up and is ready for configuration. Note1: RMS-200 units should be mounted inside a steel enclosure that is grounded properly to prevent Electro Magnetic Interference. RMS-200 is powered up, Now what? We recommend configuring RMS-200 before deploying it in the field. Simply plug RMS-200 into your network or computer using an Ethernet cable (Straight or Cross). When RMS-200 is turned on it boots the Linux operating system and uses the values stored in its configuration files to bring up the system. The default values consist of an IP address, username, and password. The default IP address is 10.10.10.10. 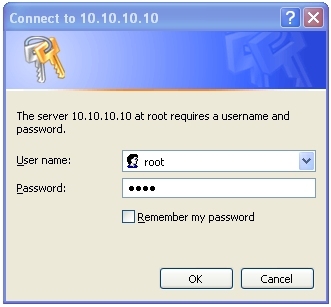 The default username is root. The default password is pass. FACTORY RESET How to factory reset your RMS-200 board. You may at anytime restore the RMS-200 device to factory default values by pressing and holding down the micro push button #1 located near the console port and then turning the RMS-200 device on with the on/off switch. Release button #1 when the alarm leds start to flash. 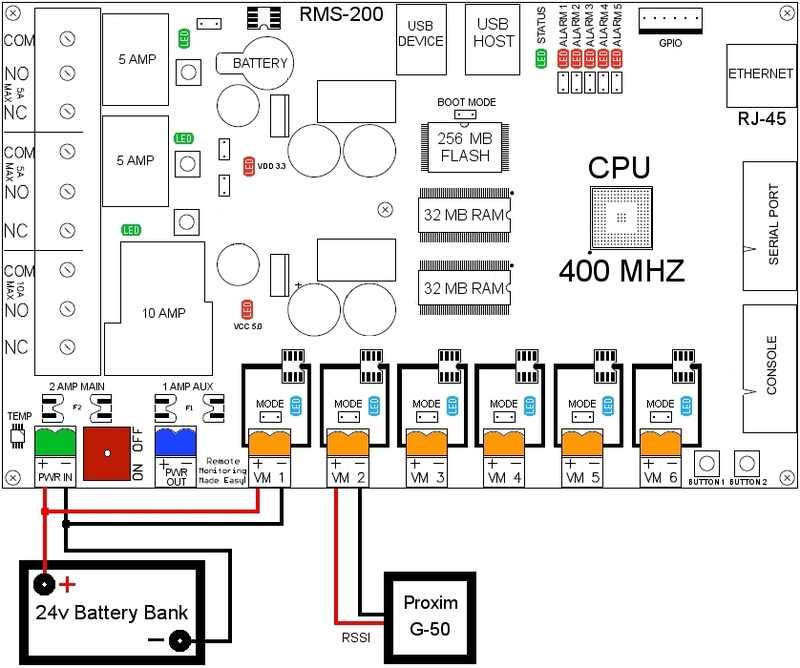 When the alarm leds stop flashing, the RMS-200 unit will be ready to configure. Enter in the default username and password then press the OK button. You will be taken to the RMS-200 Home page. 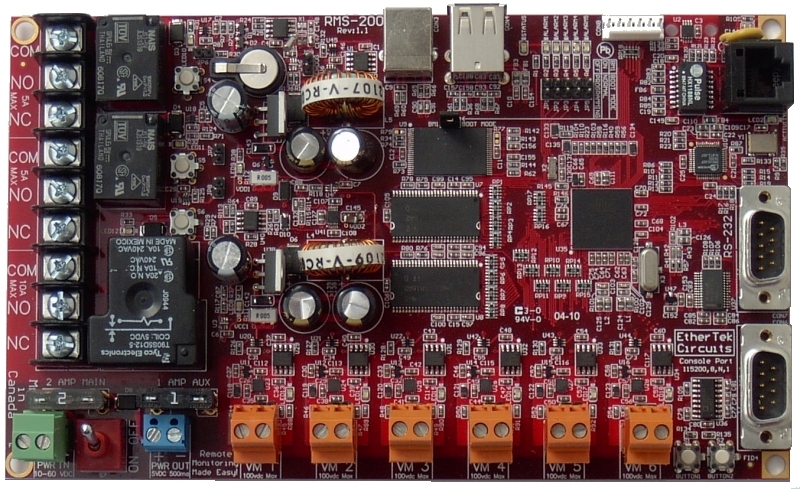 This page contains an overview of all of the functionality of the RMS-200 board. Here you will want to visit the following areas: Company Setup , Network , System Time , Contact Information , and Change Password. Adjust the Station Name, Location, Domain Name, IP Address, Subnet Mask, Gateway, DNS, and password you want the device to have. Caution must be taken when configuring the device, entering incorrect values may cause you to lose connectivity with the device, forcing the need for a factory reset. Once you have RMS-200 configured properly, it is ready to deploy in the field. Below are some basic examples of how to install the RMS-200 unit. To monitor your main battery power supply, run a wire from the positive side of the battery bank to one of the Voltmeter positive inputs. Run a second wire from the negative side of the battery bank to the corresponding Voltmeter negative input as shown in Figure 2. 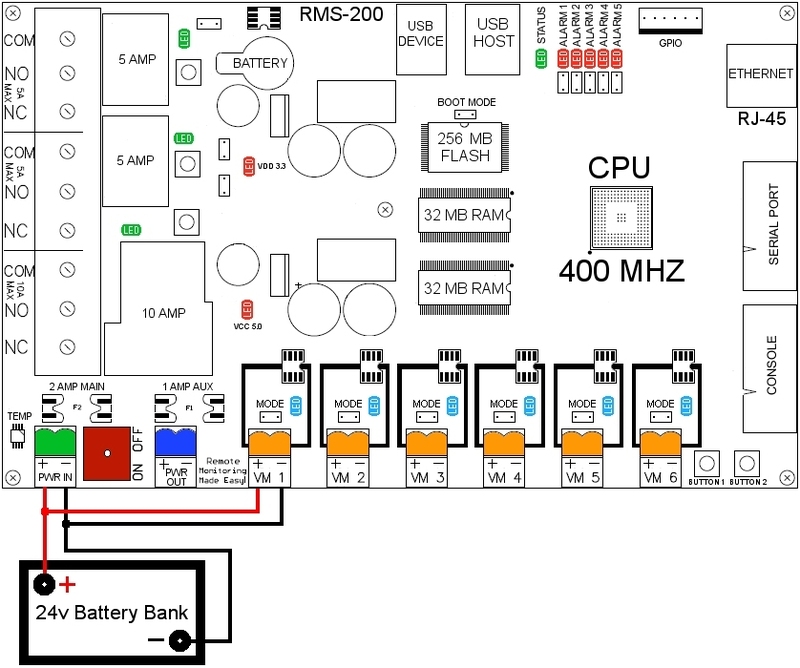 Connect RMS-200 to the internet with a common Ethernet cable and monitor the voltage level of your battery bank with a web browser. Radios that have an external RSSI port for checking signal strength can be monitored with ease. 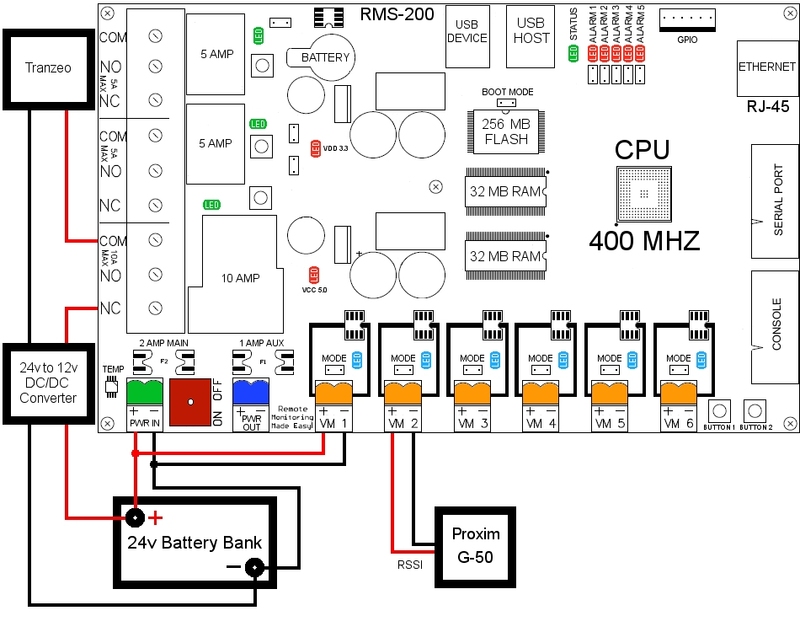 Simply attach the RSSI output from the radio to one of the Voltmeter inputs on the RMS-200 board (see Figure 3). Monitor the signal strength of your radios with a web browser and/or have RMS-200 alert you by email if the signal falls below a certain threshold. To make any device remotely resetable, simply cut one of the wires in the power cord of a device. Attach one side of the cut wire to the COM terminal on one of the Power Relays. Attach the other side of the cut wire to the NC (normally closed) terminal on the corresponding Power Relay. Reset your device at any time using RMS-200. Note: in the Normally Closed configuration, power still flows to your device even when the RMS-200 device is turned off. Virtually any 1 to 240 volt AC or DC device can be turned ON/OFF remotely this way. The two small Power Relays can pass up to 5 amps each, the larger Power Relay up to 15 amps!. For devices that should be by default turned off, use the COM and NO (normally open) configuration. 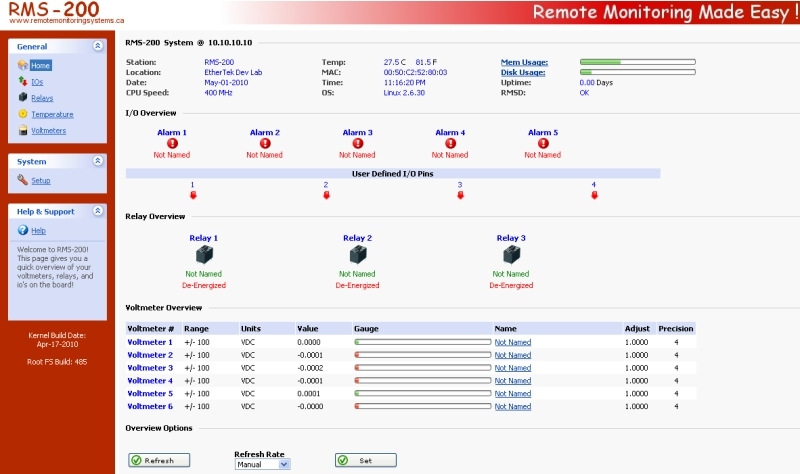 Figure 4 illustrates just one of the many ways you can set up devices for remote reset. To give your equipment room some security you can use widely available common door contacts. These contacts allow current to flow through them when they are in close proximity with each other. RMS-200 can sense when the contacts are together or apart. Program the alarm pins to send an email, run a custom file, and/or toggle a relay when the door gets opened. The diagram below (figure 5) shows how to use Alarm pin 5 to monitor door contacts. See our Projects Page for instructions on how to use the alarm pins to prevent solar panel theft. The graph above depicts main battery power at our wireless internet repeater site on Apex Mountain. Bumps in the graph represent charging from either solar panels or an Air403 wind turbine. Supplementary power is provided by a Honda Generator that is remote started with RMS-200. The 24v battery bank is monitored by RMS-200 and the graph is updated every minute. This provides a quick and easy way to check battery levels at anytime from anywhere a web browser is available! The graph above depicts room temperature at our wireless internet repeater site on Roderick Dhu Mountain. Dips or bumps in the graph represent temperature changes. The temperature of our equipment room is monitored by RMS-200 and polled every minute. This provides a quick and easy way to check temperature at anytime from anywhere a web browser is available! The graph above depicts system load of the RMS-200 at our wireless internet repeater site on Hedley Mountain. Dips or bumps in the graph shows how hard the processor is working. This provides a quick and easy way to check system performance at anytime from anywhere a web browser is available! 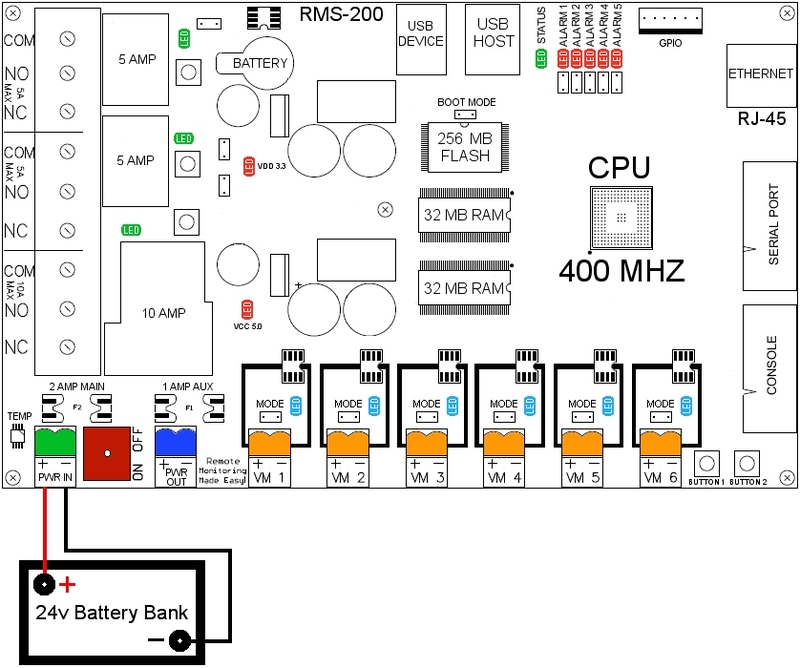 RMS-200 is a remote site monitoring board with many features to keep your equipment running reliably.